Robert Kiyosaki’s Cashflow 101 Boardgame is designed to help you achieve financial freedom, but is it worth investing in? 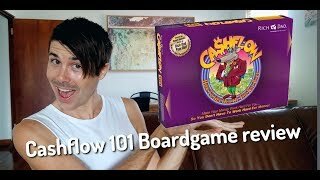 In this Cashflow 101 review I look at what the game is like, the replay value and whether or not I recommend you buy it. 1:09 – How much is Cashflow 101? 1:40 – How does the game work? 4:56 – Do I think this game is worth purchasing? Robert kiyosaki’s cashflow one-on-one board game is a board game that is designed to teach you financial skills and teach you some skills that you need to move towards becoming financially free and achieving financial freedom in your life. In this episode, I want to talk about my experience with the cashflow one-on-one board game and whether or not I would recommend it. Hey, I’m Ryan from on-property dot com data. You helping you achieve financial freedom and this video was a request from a viewer that said, what do you think about the cash flow board game isn’t worth investing in because it is quite an expensive board game. I myself love playing board games. I love cards against humanity that is absolutely hilarious. Monopoly. I actually refused to play anymore because they’ve just been too many fights with friends and family members over monopoly and I just get quite competitive and I have my strategy when I play monopoly. That’s not really a fun strategy for everyone else. It’s a strategy to try and win at everyone else’s expense and so it’s just. It’s not good is not good for me, but what about cashflow? One-On-One isn’t going to teach you the skills. Is it worth investing in because it is quite inexpensive. Board game, how much is a. let’s check it out on Ebay. Okay. On Ebay I can see it’s selling for around 70 to $90. Now we’re going to check Amazon on Amazon it’s about $140. So yeah, Ebay is probably the better option. I can link up to the board game down below if you guys are interested in it, but about 70 to $90 for this board game. Now I purchased this board game about nine or so years ago. I was really into Robert Kiyosaki’s books. I still love his books today, but decided to go ahead and spend the money, purchase the board game to play with my then wife as well as my friends and signing off the board game is really quite fun to play. The premise is you pick a card and you get a job, so in that job you might be a janitor and you have a low income or you may be a doctor and have an extremely high income. So you were thinking it’d be better to be the doctor with the high income and in some circumstances that does help, but the goal of the game is to actually fully replace your income through the investments that you make. So one of the benefits of being the janitor with the low income is you don’t need to earn as much money in order to become financially free and to move from the rat race onto what is it? The fast track, I think it’s called in the gang and so that’s the idea. You get a job, you need to invest in order to become financially free. You also get a sheet that has your assets, your liabilities as well as your income and expenses. So you need to manage that. So the first one or two times that you play the game, it’s really great because you’re learning how to use that sheet with your income expenses, assets and liabilities. That’s really useful tool to see the money moving and how your assets effects that. It’s also interesting to move around the game and to read the cards and see what investment options that are. But the problem that I had with the game is after you play it a couple of times, it becomes extremely repetitive and redundant and boring to the point where I think I played it maybe two or three times with my wife and some close friends and then some other friends of ours had purchased the game and we went to play with them and we played it in a larger group of people. Um, but it was just completely boring for me because I had played a couple of times. So there’s a few core concepts in the game that are really interesting to learn, but once you learn them, the game becomes extremely boring because when you’re in the rat race, basically you have different investments from memory. Most of them are property investments now it may have changed. Remember I did by about nine years ago and haven’t played it since, but most of them are property investments and you can quickly see whether it’s positive cashflow or negative good. And the game highly incentivizes you to invest in positive cash flow properties. There are some circumstances where you get capital growth and you can use that to leverage into more properties, but it’s kind of a rare situation in the game. The game really rewards just purchasing those positive cash flow properties, those positive cash flow assets. You may be able to purchase businesses as well, but just purchasing those in order to achieve financial freedom and then as soon as you’re on the fast track, the game becomes even more simple and more boring because basically you just move around the track and your money grows exponentially really quickly and then you get to choose a dream that you want to purchase. So once you get off the rat race, the game becomes like it’s just a rolling dice basically. So do I think this game is worth purchasing? I think if you’ve read some of the rich dad poor dad books, the books by Robert Kiyosaki, Rich Dad, poor dad and cashflow quadrant, retire young, retire rich has really good as well. I think the board game can be great to put in practical use what you’ve learned in the books. It can also be a great way to introduce friends or family members who you know aren’t as passionate about money or honest, passionate about personal finance and investing and financial freedom as you. It can be a great way to introduce them to the concepts of financial freedom and the concepts of investing in income producing assets. If you know they’re not going to read the books, but truthfully I think reading the books, you’re going to get way more out of the books that 10 or $20 in order to purchase the books. I will leave links to my recommended Robert Kiyosaki books down below, so if you want to check out those books and purchase them, you can. Reading the books is going to be way better than doing the board game. I would. I did want to purchase. There’s a cashflow 100, two or two. Oh two that is more advanced and goes into different stock options and things like that, so that would be really interesting. Maybe I should purchase that and play it and do a review on that if that’s something that you are all interested in, but yeah, cashflow 101. If you’ve got the money, go ahead and spend it. Play it a few times and then when you get bored of it, go ahead and resell it back on Ebay, so buy it for 70 and $90 and then play it a few times and then sell it for $40 or whatever you can get for it and you’re going to have a small outlay of money, played a few times, learn the concepts in there and then move on with your life. It’s not really a game that you would play over and over and over again because it just doesn’t have that replay value. Well, I didn’t find that it had that replay value, so all in all it is a good game, but yeah, it’s just it gets a bit boring over time. And the concepts, if you’re good with understanding finances, if you’re good with numbers, the concepts are really basic and really simple. If you struggle with numbers, you struggle with money management, you struggle with understanding how money moves around that or maybe a better investment for you than it was for me. So cool game, cool concepts, expensive, doesn’t have massive replay value, but great for a few times and the core concepts that are does teach a really important, but you’re not going to become financially free just from playing this game. It gives you the idea that you need to invest in income producing assets in order to achieve financial freedom. It gives you the idea that financial freedom is the end goal and it gives you a couple of skills of how to manage your money and how you can see money moving around your bank accounts and stuff like that, so it kind of gives you those ideas, but it’s not going to give you the skills to then go ahead and invest in real estate. That’s something that you’ll need to study separately. It’s not going to give you the skills to go ahead and invest in stocks. That’s something that you’re going to have to study separately, so it’s not going to give you those skills, it will give you some basic skills to get you started, but then you really need to expand upon that yourself. Start getting passionate about investing or starting businesses or whatever it may be in order to then go ahead and achieve that financial freedom. So it’s a great little first step to get you started, but if you’re already an advanced at best, if you’re already an advanced investor, it’s probably going to be too simple and too boring for you, but it may be something that I look at doing with my kids. I know there’s a cashflow for kids board game, so it may be a concept and maybe an idea to purchase it for them. Um, but that could be another review as well. So they have my ideas and my thoughts on the cashflow one board game. I love Robert Kiyosaki’s staff. Again, I’ll link to the books that I love appears and recommend that you read in the description down below. Thanks so much for watching this review. I’ll also leave the links to the board game on Ebay or Amazon if you want to purchase from Amazon down below as well. I’m going to go through a bunch of Robert Kiyosaki’s books this year, so I want to reread them and as I’m reading them, write down notes and think about the core concepts and then share those with you guys, so if you don’t want to read the books then I will be doing videos on the core concepts and things that I got out of the books in the future. I’m really excited to do that. Thanks so much for watching. You can check me out and everything that I do at on-property dot com dot a u and until next time, stay positive.